It’s been another passive-aggressive spring in southern New England. Showing up weeks late, spring arrived in a tremendous rush this year — trailing swarms of insects and rapidly pushing the temperatures up into the eighties. The daffodils and tulips which had been dozing under a blanket of snow were shaken rudely awake and forced into flower almost overnight. As a result, my spring bulbs which usually are given the chance to take individual turns on the red carpet had to share the spotlight this year with all the other beauties. 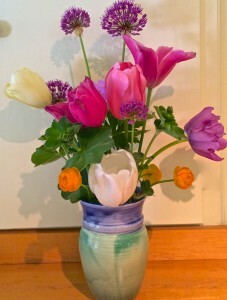 I buy my tulips in bulk from White Flower Farm, favoring their “Pastel Stretch Mixture” which combines over 50 varieties of Dutch bulbs, so each bloom is a surprise. Though it normally takes a month or so for all of them to flower, this year they blasted up and open in just two weeks. They’re in their final stages of life now, which reminded me of this lovely poem, composed in quatrains (four line stanzas) where the first and fourth line rhyme as do the second and third. It seems to me that the symmetry and whimsical tone of the poem subtly echoes that of the tulip itself. Thank you for the tulip praise. Thank you for collaboration for the Local Yokel. You’re welcome, Doane. Thank you for the wonderful photos of the concert. Beautiful. I, too, watch the tulip ballet, but in a vase at home. Thanks, Bucky. Yes, it is a ballet, isn’t’ it? I tried to buy some tulips in the city last week, but was told that the “season was over for them.” I was disappointed at first, then gratified to think that there still are a few things in life we have to wait for. Sometimes we appreciate all the more that what we wait for patiently. 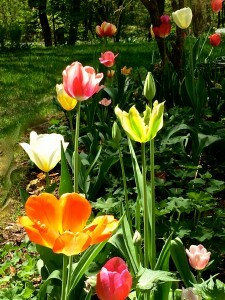 Tulips are wonderful but it would be hard for me to pick a favorite flower…I love so many. Was enjoying some yellow sweet peas today. How lovely are those tulips and that poem! I seem to have missed last week’s blog and am so glad I did catch up with it. Bravo to you for such a beautiful poem and viewing of your tulips. Today being so gloomy, they certainly have brightened my day. Thank you!